Planning a corporate event? One of the most challenging aspects of corporate event planning is coming up with an idea. The event theme is the driving force behind every other aspect of an event, from the invitation to the selection of entertainment and food. Before you get busy with any other part of the corporate event planning process, first pin down the goal of the event. The best corporate event ideas take that business objective — after all, corporate events have business objectives — and use it as the springboard for the event theme and the overall atmosphere of the event. Corporate events can set the stage for presenting information regarding a company’s upcoming product launch, a new approach to corporate training, or simply for conducting team building exercises in a fun, engaging environment. As a corporate event planner, your first step is to determine the event's objective. Company picnic with a cookout featuring fare from local establishments produced from local farms, music, and games, such as corn hole competitions or croquet matches, with both blankets and chairs for seating. Winery tour and winemaking demonstration followed by a picnic lunch outdoors on the grounds for a real day away from the office. Whatever the choice, keep the staff in mind when planning the event. If employees consider this outing just “one more work event” they have to attend, you will have missed the mark. 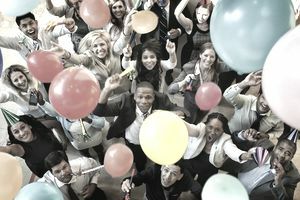 Keep the employee demographics and the office atmosphere in mind when planning a corporate event of this type.